Long before a ball had been kicked in anger, Chris Wilder warned it was still too early to talk about season defining moments or pivotal games. With only eight matches remaining, he knew those words were bound to raise eyebrows. 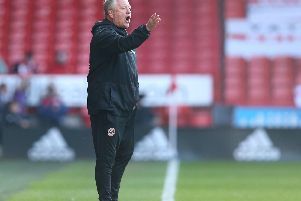 But experience has taught the Sheffield United manager, now chasing his third promotion in as many years, that strange things can happen during the closing stages of a campaign. Wilder must hope his hunch is correct after a minute or so of dramatic Championship action saw what now appears to be the race for second place swing back in Leeds' favour. Andreas Weimann was still celebrating his hat-trick, which saw Bristol City become the first visiting team to win at Bramall Lane since January, when news filtered through that Pablo Hernandez's late effort had seen Marcelo Bielsa's side take the lead against Millwall. United tried and failed to find an equaliser. Forty-miles to the north, their rivals from Elland Road held on. All of which meant, a fortnight after securing a crucial victory in West Yorkshire, Wilder's squad finished the weekend two points behind the Argentine's men and trailing leaders Norwich City by a further five. "There's going to be twists and turns," he insisted, having earlier teased journalists for flogging that particular saying to death. "One hundred per cent, you can see it's going to be tight. I don't get involved with what's going on elsewhere during a game but this is the way it's going to be from here on in. "One minute we're going up as champions. The next we've got no chance. That's the emotional response but we've got to cut through all that and make sure it stays as close as it is. We shouldn't allow a bad day at the office to wreck what we've done." Wilder cut a disappointed but philosophical figure as he digested the implications of a result which ended both United's long unbeaten run and hopes of recording an eighth successive clean sheet. Yes, he acknowledged, City deserved to prevail after twice dragging themselves level. But, given the unpredictable nature of the competition, Wilder also reminded United had been dealt a painful rather than fatal blow. "There's still an awful lot of football to be played yet," he said. "And an awful lot of good opponents to face. "Speaking among the staff, we always thought this was going to be the hardest one given that City are good and we were coming back from a break." Wilder's demeanor during the build-up to the fixture had betrayed his fears about this contest. Despite talking-up United's own credentials, a predictably passionate call-to-arms was also peppered with references to the threats the visitors would pose. City, given their fluid movement and enterprising approach, proved to be the wrong opposition at the wrong time for a United squad missing one key player through injury and nursing several others back into action following international duty. Kieron Dowell, thrust into action when Mark Duffy damaged an Achilles in training, looked lethargic after featuring twice for England under-21's while David McGoldrick, recently recalled by the Republic of Ireland, faded as the fixture unfolded. City, and Weimann in particular, took full advantage although, as Wilder later conceded, United gave them a helping hand. "The boys who went away, they looked a little bit sluggish," Wilder said. "I'm proud they go but it has been a long week. "You look at how they played and the minutes they played. Looking at some of them in isolation, they ran their nuts off for their national teams and so they should. But it was always gnawing away at me, that we had to try and get through this game." 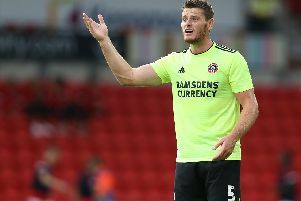 When first Billy Sharp and then substitute Scott Hogan fired United ahead, it appeared as if they would do exactly that. But with Josh Brownhill drawing a fine save from Dean Henderson before later seeing a free-kick rebound back off a post, United were always hanging on to a lead rather than promising to extend it. Weimann grabbed the headlines but, in truth, the outcome was decided in midfield where a combination of Brownhill's invention and Marlon Pack's industry punished United's wayward passing. "It was stressful to be involved in but I enjoyed it," Lee Johnson, the City manager, admitted. 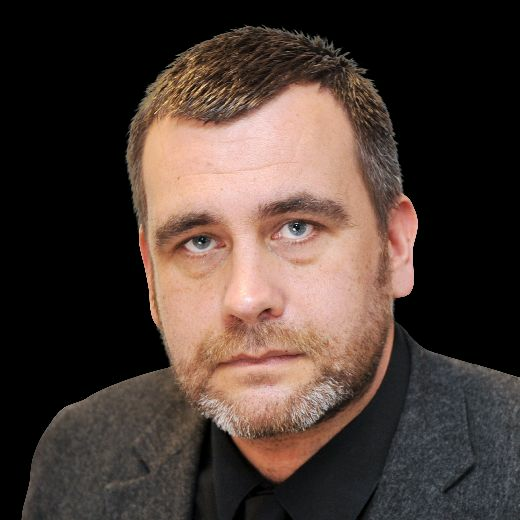 "Coming here, I've got nothing but credit for the way Sheffield United play their football. It's a tough environment but we showed character, commitment and quality. And then there were three great strikes from Andreas." "What you saw out there was two honest sets of players going hammer and tong," he added. "It was an open game and, because of how United go about it, we always thought if we were going to take something away with us we'd have to score at least twice." John attributed Sharp's goal, his 24th of the season, to some poor officiating after complaining of a foul. But United's captain simply showed more desire to reach John Fleck's set-piece than his marker. Wilder questioned whether Henderson could have reached Weimann's first, which spiralled over his head and into the net, but the youngster seemed to simply lose sight of the ball in the sun. Hogan, netting his first since arriving on loan from Aston Villa, also showed great determination to turn home George Baldock's deep cross as United came roaring back before Weimann turned on the after-burners; hooking Kasey Palmer's fine pass back across Henderson before finding himself unmarked inside the box. "We gave away some poor goals from our perspective," Wilder said. "But you've got to give City the credit as well. "Nothing was ever going to be decided today, though. Not by a long chalk. I'm sure these boys will respond in the same way they always have." Sheffield United: Henderson, Basham, Egan, O'Connell (Johnson 77), Stevens, Baldock, Norwood, Fleck, Dowell (Hogan 46), Sharp, McGoldrick. Not used: Moore, Coutts, Stearman, Cranie, Washington. Bristol City: O'Leary, Dasilva, Webster, Wright (Palmer 73), Smith (Paterson 73), Brownhill, Diedhiou, Weimann (Baker 86), Pack, Kalas, Hunt. Not used: Marinovic,Taylor, Kelly, Eliasson.